The range and scope of religious action on environmental issues is growing all the time, and while ARC is involved in partnership with many initiatives worldwide it is very important to be aware of the great work being done by other faith groups and religious NGOs. Each of the sections on religions in this website has a page of links to faith-specific environmental agencies and campaigns (see below) and this page has useful links to websites about multi-faith action to care for creation, new campaigns and infrastructure support agencies. FaithAction is a UK network of Faith based and Community organisations serving their communities by delivering public services (such as childcare, health and social care, housing and welfare to work). We empower Faith based and Community organisations by offering support and training, disseminating key information and acting as a connector between Government and grassroot organisations. 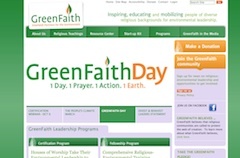 GreenFaith's mission is to inspire, educate and mobilize people of diverse religious backgrounds for environmental leadership. Our work is based on beliefs shared by the world’s great religions - we believe that protecting the earth is a religious value, and that environmental stewardship is a moral responsibility. The National Religious Partnership for the Environment is an association of independent faith groups across a broad spectrum: the U.S. Conference of Catholic Bishops along with its affiliated program arm the Catholic Climate Covenant, the National Council of Churches USA and its affiliate Creation Justice Ministries, the Jewish Council on Public Affairs and its affiliate the Coalition on the Environment and Jewish Life, and the Evangelical Environmental Network. The vision of the Green Pilgrimage Network is of pilgrims, and the pilgrim cities and places that receive them, becoming models of care for the environment and leaving a positive footprint on this earth. Members of the Green Pilgrimage Network support this vision, and commit to create an action plan to transform their pilgrim city, place or route into a green, sustainable model in keeping with the beliefs of our faith or the faiths of their pilgrimage place. One World Week works through volunteers from different faiths throughout the UK and abroad who organise events to draw attention to global development issues such as poverty, climate change and fair trade to "to increase equality, justice and sustainability, locally and globally." Eco-Faith is a collaboration of over 30 faith groups from the Dorset area signed up to The Big Green Believers' Agreement which commits them to "engaging in practical and measurable sustainable steps, to sharing their successes and to inspiring others to engage." Here are links to the pages in our faith sections giving links to relevant faith-based environmental organisations and other relevant agencies. ARC is a broker between faiths and secular organisations wanting to work with faiths on environment programmes. 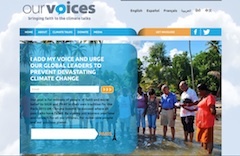 Spiritual and religious leaders from around the world are launching the interfaith ourvoices.net initiative to let world leaders see the moral imperative for a global climate treaty by the December 2015 Meetings in Paris. Includes a new prayer by Archbishop Desmond Tutu. Hazon is a Jewish environmental organisation which takes its name from the Hebrew word "vision". It has a vision of faith-led community agriculture programmes all around the US and the world.